Subscribe to Tiny House Magazine here. This article includes adaptations from Andrew Heben’s new book, Tent City Urbanism: From Self-Organized Camps to Tiny House Villages. A village of tiny houses—it’s a place many of us have dreamed of. A place where humble dwellings dot a landscape filled with common gathering areas and organic gardens. Where neighbors come together to share resources and make decisions about how their community is run. Yet urban policies have kept it a vision in the distance—or at least in the shadows. But now, perhaps unexpectedly, the tiny house movement has a new ally as tent cities organized by the homeless are helping to open the doors to this kind of human-scale environment in the United States. While “tent city” tends to trigger images of third world countries, I have documented dozens of American examples over the course of the last four years. And while they are commonly dismissed as disorganized or deviant, I have found that they often exemplify self-management, direct democracy, tolerance, mutual aid, and resourceful strategies for living with less— qualities that address many of the shortfalls of traditional responses to both poverty and housing. Consequently, self-organized tent cities provide an ideal foundation for a village model—a model that physically builds upon the positive social dynamics of the camp by progressing from tents to tiny houses. This concept was pioneered by Portland’s DignityVillage in 2001, when 60 otherwise homeless individuals legally acquired one acre of city-owned land, building tiny houses largely out of recycled materials. 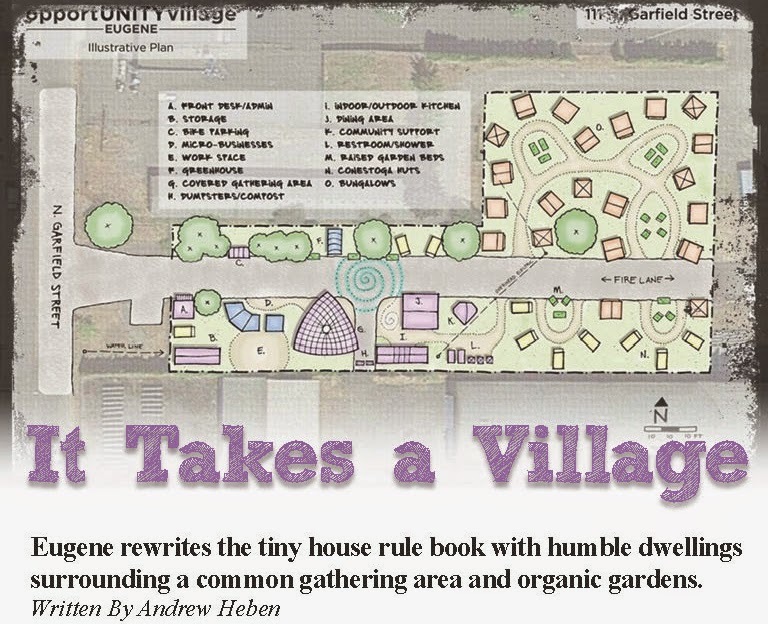 More recently, in 2013, the concept has been re-imagined by Eugene’s Opportunity Village and Olympia’s Quixote Village. And now it has spread from the Pacific Northwest to inspire projects like Madison’s OM Village, Austin’s Community First Village, and Ithaca’s Second Wind Cottages. Acceptance of building small has tremendous implications. Public officials are embracing the tiny house as a creative solution for addressing the emergency of homelessness, and in doing so, they are setting precedent for extending similar housing options to other demographics as well—including those who could live a more stable life devoting less of their income to rent, those with an interest in downsizing their environmental footprint, and those seeking life in a community rather than a commodity. Opportunity Village opened its gate at the end of August 2013. Over the course of the next nine months, 30 tiny houses were erected to provide “transitional micro-housing.” The 60 to 80 square foot structures use a modular panelization technique that simplifies the assembly process while still allowing for a degree of variety. This accommodated volunteer labor and allowed for low-cost construction, with each house being built for around $2,000. A conditional use permit was acquired for the site and building plans were approved by the City of Eugene. Due to the nature of our project, the city worked with us to reduce the technical and financial burdens of the permitting process while still ensuring structural integrity. Following this, the tiny houses were built incrementally during collaborative building events that included residents, volunteers, and skilled builders. Following a city building inspection, residents were then free to move in and personalize their new home—adding things such as front porches, gardens, insulation, paint, and storage lofts. While today’s tiny houses often incorporate many of the conveniences of the modern home into each unit, the houses at Opportunity Village are simpler and lack utility hook-ups. Instead the individual dwellings are supported by shared common spaces. This includes a 750 square foot yurt for meetings and day-to-day gathering, a 160 square foot kitchen with a large canopy, a 112 square foot bath house that includes two restrooms, a shower, and laundry room, an 80 square foot office, and a mobile tool shed and workshop space. Sharing facilities not only reduces costs, but also provides a feasible method for legally developing tiny house communities. By placing several tiny houses on the same property with shared facilities, the development can be classified as a “congregate living facility”—similar to college dormitories or assisted living centers. Under this interpretation, the tiny house is distinguished as a “sleeping unit”—a space that can provide provisions for sleeping, living, eating, and either cooking or sanitation but not both—rather than a “dwelling unit,” which has much more stringent code regulations. With generous donations of time and materials the entire village was built for just under $100,000—half the average cost of one unit of conventional low-income housing construction. Capital costs were covered by private donations and grants, and each resident now contributes $30 a month to share utility costs. Along with building small, self-management also helps to keep costs low by eliminating the traditional need for on site staff. Instead weekly meetings are held in which residents democratically vote on a variety of issues, and a village council of seven members is elected to maintain order between meetings. Oversight is provided by a non-profit organization, Opportunity Village Eugene (OVE), which is composed of both housed and unhoused representatives. Basic rules are upheld in the village through a community agreement that all residents must sign. The agreement prohibits drugs, alcohol, violence, theft, and persistent disruptive behavior on site, and requires all residents to contribute back to the village in some way through construction projects, hosting the front office, fundraising, micro-business initiatives, gardening, cooking, or any number of other supportive activities. With one village up and running, OVE is in the planning stages of a new kind of village. While Opportunity Village focuses on transitional housing in an effort to serve a larger population, Emerald Village will provide more attainable and sustainable places to transition to. The idea here is to build long-term affordable housing based on a similar grassroots model. By continuing to build small and utilize local resources, the village model can revolutionize modern approaches to affordable housing. An initial concept plan calls for 15 tiny houses at 120-150 square feet each finished with a kitchenette and electrical hook-ups. Similar to Opportunity Village, the housing will be supported by common gathering, kitchen, and restroom facilities. Residents will make monthly payments of approximately $200 toward utilities and a share of the village. 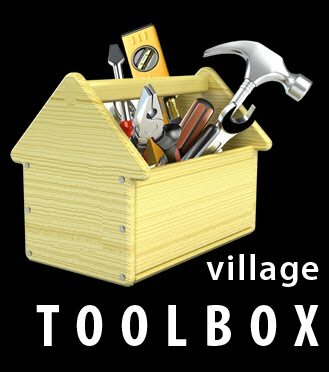 If a resident decides to leave the village, they will then be able to sell their share back to the non profit. Up until now, the tiny house movement has highlighted the critical need to downsize from larger, unsustainable living spaces. This approach expands that scope to also emphasize the potential of the tiny house as a mode of upsizing from tents to very basic tiny houses. By including both ends of the spectrum—those downsizing and those upsizing—we can overcome many of the regulatory obstacles, and restore a very low cost housing option that appeals to a vibrant mix of people—blurring the line between the housed and the unhoused. This is the best approach for wrapping up an undertaking and Tarpon Springs painters prepared temporary workers who are worried about client benefit know about this.